Dynamic singer-songwriter Norah Jones hit the Apogee Studio in Santa Monica, California for a performance and interview with KCRW's Morning Becomes Eclectic. The set had a little of everything, with a few numbers off the soon-to-be-released LP Day Breaks, several choice songs from her 14-year recording career, and a gorgeous version of the Grateful Dead's "Must Have Been The Roses" to close things out. Kicking off the intimate performance with a passionate new R&B song called "Tragedy," Jones then dove into two crowd-pleasing tracks off her Danger Mouse-produced 2012 album Little Broken Hearts, "Out on the Road" and the title track. After playing two more Day Breaks cuts, "Flipside" and "Carry On," Jones sat down for an interview with KCRW host Anne Litt, chatting about late-night kitchen jams, motherhood, and her history of musical collaboration. After playing a smoky, effortless "Don't Know Why," Jones ended the show on a rock and roll note. The band's melancholy "Stuck" guitar intro sounded a bit like Beyonce's Lemonade slow jam "All Night" and really picked up with a blistering guitar solo from Jason Roberts. Then, Jones picked up an acoustic guitar for the ballad-to-end-all-hippy-ballads, "It Must Have Been the Roses," explaining first that, "It's a song we do a lot because we love it and it's not on an album, but I just thought it would be fun." Day Breaks, Jones' sixth solo album, is scheduled for release on October 7 — that's next Friday! Pick it up on Amazon. Jones has also announced 2016 fall tour dates with Valerie June. 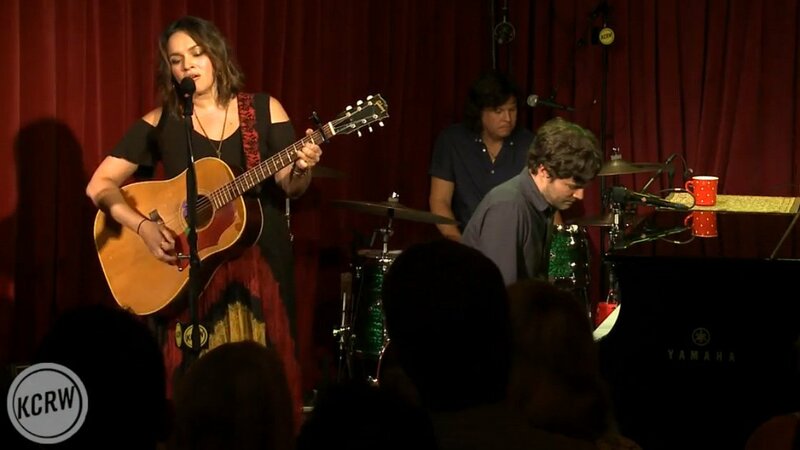 For more music, news, and tour dates, check out Norah Jones' Zumic artist page.